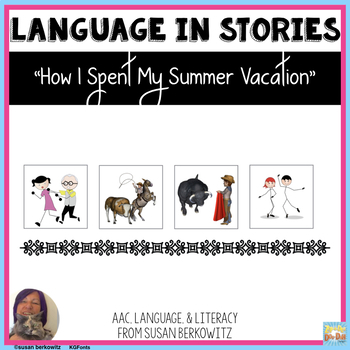 Head back to school with this fun book that can serve as a lead-in to students talking and writing about their own vacations, and/or as a precursor to talking about Tall Tales, exaggeration, make-believe, truth vs made-up, imagination. ☀ There are 18 vocabulary cards. Use them for card games for vocabulary practice or students can paste these into a vocabulary notebook and write in the definitions. You can use the vocabulary meaning activity page. ☀ There is also a page to match pictures to their definitions. ☀ There are 16 rhyming words - 8 pairs from the story. ☀ There is a page for counting syllables in some of the vocabulary words. ☀ There is a working with words page for changing sounds in words to make new words. 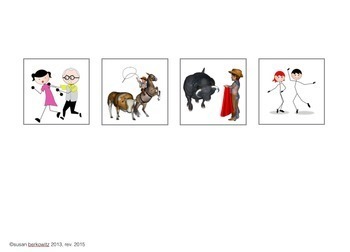 ☀ There are pictures for students to sequence, with or without verbally re-telling the story. There are 3 different sequencing length/complexity activities to choose from using pictures (3, 4 and a complex episode 12), and 1 using sentence strips, as well as templates for others. ☀ There are character and setting maps. Have students find the words in the book that define or describe the characters and settings. Put those into a character or setting map, using the Describing Map page. 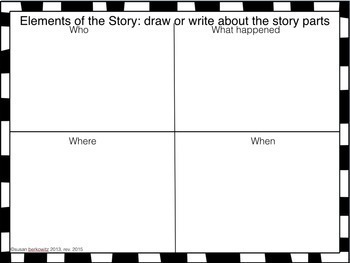 ☀There are a couple of different organizers you can use to have students identify the story elements. • The first is the often-used Somebody-Wanted-But-So framework. 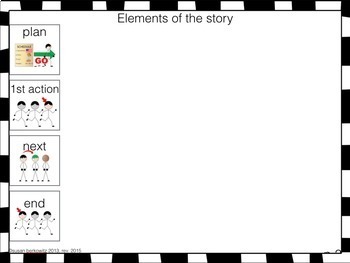 • There is also an 8-part story element template (2 pages) for students to fill in character, setting, problem, plan, actions, feelings, and solution. • There is a story die to use to play a re-telling game. ☀ There is a compare/contrast activity to compare travel by train and horse. ☀ There is a ‘locate me on the map’ activity. The plains cover a large area of the U.S. Do you live within that area? To the south? The east? ☀ There is a writing activity, with a place for students to draw something that happened on their vacation, or that they wish happened, after which they can write a brief sentence or paragraph (or more, if they are able). ☀There are visual cues to help those students who need them to remember which elements their narrative should contain. ☀ There is a generic reading vocabulary board using core words. This resource contains picture communication icons and visual cues for students who need them. This can be used for differentiating instruction in a general ed class with inclusion students, or in special ed classes, resource rooms, speech-language therapy. ► Reading Literature 1.3: Describe characters, settings, major events in a story with key details.